Magnus Magnusson edited two books published by The Folio Society, both titled Icelandic Sagas. The first volume was first published in 1999 and illustrated by Simon Noyes. The second volume was first published in 2002 and illustrated by John Vernon Lord. He also edited another book titled Iceland Saga, published by Tempus Publishing in 2005. Please do not combine these three books as they are all different. 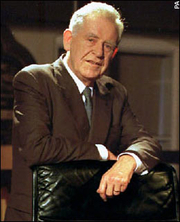 Magnus Magnusson, KBE (12 October 1929 – 7 January 2007) was an Icelandic television presenter, journalist, translator and writer. He was born in Iceland but lived in Scotland for almost all of his life, although he never took British citizenship. He came to prominence as a BBC television journalist, and was best known as the presenter of the BBC television quiz programme Mastermind, which he hosted for 25 years. Magnus Magnusson is currently considered a "single author." If one or more works are by a distinct, homonymous authors, go ahead and split the author. Magnus Magnusson is composed of 18 names. You can examine and separate out names.